As children age and mature, they strive to find a sense of purpose and belonging in the world. From the development of their identity to how people perceive it, kids are constantly piecing together how they fit into our society. This can be an exciting and stressful time for many youths, as new processes and skills come into play. Children who have gone through the adoption process often face additional stressors, as the fact that they are from different parents can be enough to single them out as an outsider. Learning about this process may prove useful for many prospective parents who are considering adopting a baby. Instead of working with any typical adoption agency in California, you can turn to our quality experts for an amazing experience! A is 4 Adoption proudly helps adults nationwide through the open adoption process, working as the intermediary in order to foster the best possible outcome for the child, birth mother, and adoptive parents. We do everything possible to cut through the red tape and deliver more beautiful children in need into the arms of more loving families. 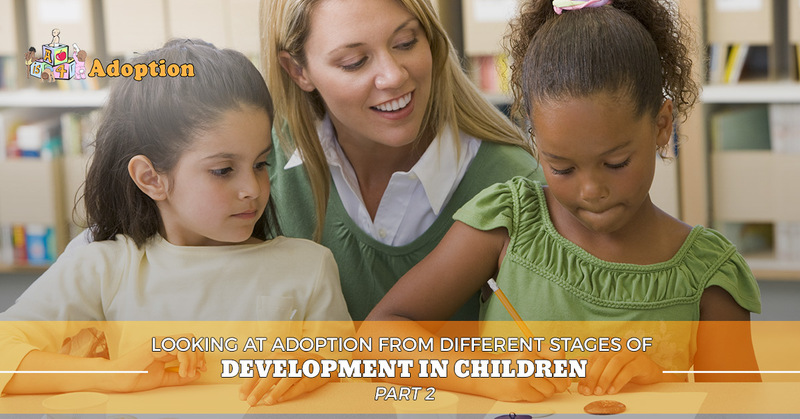 Today, we’ll look at a few more stages of development in children and how it can play into their psychology of adoption. If you are a birth mother looking for assistance, or prospective parents hoping to grow your loving family, be sure to contact us today to get started! As your child grows older, he or she will constantly strive to understand and exert control over their environment. Once they enter school, adoptive children will begin striving to answer all of their big questions in the world. How do I fit in? What is the right way to act? Am I normal? The stress of fitting in with the other kids is a lot for most children, yet those that were adopted feel the additional pressure of being different. Even if you have positively explained the adoption process to your child and explained that he or she was adopted out of love from all parties involved, this can be a negative process. Children who communicate with and trust their parents may show no signs of concern about being adopted until a peer dynamic is introduced. Even if the child is too young to comprehend the complexity of dynamics leading to their adoption, they can still latch onto the negative emotions associated with being unwanted. Why would their mom not want to raise them? Did they do something wrong? The process of assimilating to the reality of being different from his or her school-aged peers with a complex range of negative emotions can result in your child being both confused and emotional. While adults can rely on decades of experience and self worth to formulate a steady concept of what their identity is, young children are grappling with the basics and how to interpret what they see. While every child will react differently when adapting into his or her school dynamic, many face feelings of abandonment and issues with self value. The idea of having no control over their family structure can open new issues for parents, as the child exhibits a fear of change and despises small alterations to the family schedule. It’s important as the parent to be patient during this period, as their child works to understand their place in the world. Continual positive reinforcement is essential, as is consistency in all approaches. Your child may act out, exhibiting a wide array of behaviors that proves their internal struggles with identity and belonging. Clueing in teachers and other adults about the feelings your adopted child is feeling and why can be very helpful in creating a supportive environment during this emotional time. As always, focus on positivity and acceptance in all tasks. Be sure to express how important love was in the adoption process and that everyone is doing their best for the good of the child! The elementary and preteen years can be a stressful time for both the adopted child and his or her parents. Taking the time to explain why they were adopted and reinforcing the support and care that goes into raising him or her can prove useful in minimizing your child’s feeling of isolation and subsequent loss of control. The peer dynamic can play a major role during this stage, so it is essential to focus on self worth and family support. Next time, we’ll discuss the teenage years and how development during this time can play a major role in being adopted. A is 4 Adoption is proud to provide quality adoption services to families nationwide. Our center aims to beat any adoption agency in California with our dedication to minimizing the stress while optimizing the chances of success. If you are a pregnant mother in need of assistance or prospective parents hoping to grow your family, our experienced experts can help every step of the way. Contact us today to see how we can help you during this exciting and stressful time!